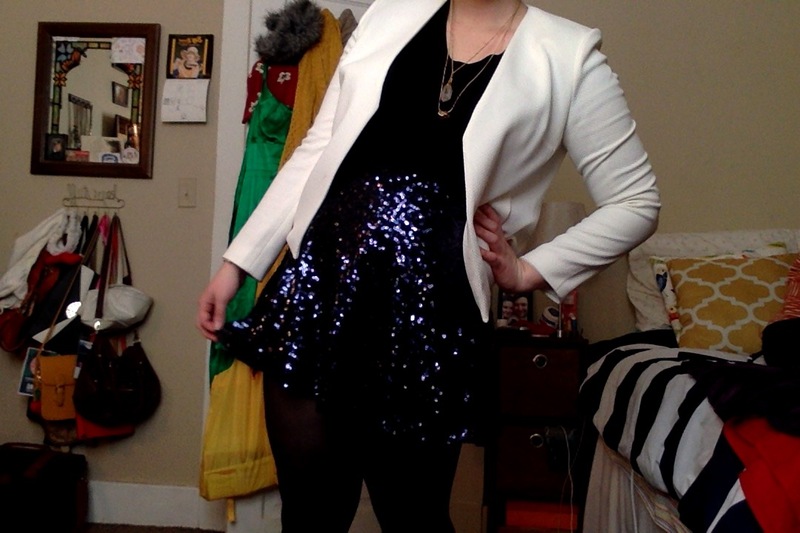 Sparkly circle skirt, how do I love thee! It’s the holidays and there are SO many opportunities to bust out the sequins. When I first saw it, I knew this sparkly navy circle skirt would be an absolute staple in my wardrobe over the holidays. Naturally, I just had to share it with all of you! Now, I’m not shy when it comes to sequins. I love looking at and wearing stuff that is super sparkly and glitzy, especially for special occasions! There are times, however, when sequins don’t really do the job. For instance, I have this rose gold sequined dress that I wore on my first anniversary in Paris with my fiancé back in 2012 and it scratched my underarms non-stop the entire time. But even though it really rubbed me the wrong way, I still love that dress and I still wear it when I can. I’ll admit that I get a lot of joy out of shopping, but even more so when all of the shops bring out their New Year’s Eve outfits. Every piece is adorned with sequins, woven with glittery fabric, or sprinkled with gems, and I absolutely love it. This holiday season I’ve seen a lot of crop top and skirt/shorts combos that are actually super cute, and if I wasn’t so self-conscious about my midriff (and if I wasn’t spending NYE in England!) I would be ALL about them. But, my eye was drawn to this navy blue sparkly circle skirt. I always get a little nervous with Forever21 sizes, especially with anything that requires a zipper, but luckily the skirt zipped up with no issues at all! I paired the skirt with a plain black v-neck t-shirt, a pair of tights, and even threw on my white blazer for added effect. Honestly, I’m so in love with this outfit that, if it were up to me, every day would be New Year’s Eve.